Musical theater has a long and varied history, but for many people its surge in the US after WWII seemed to suggest almost a new art form. This was largely due to the unparalleled creative collaboration of Richard Rodgers (music) and Oscar Hammerstein II (book and lyrics), who produced a string of unforgettable musicals during this period. These included the Broadway hit shows Oklahoma! (1943), Carousel (1945), South Pacific (1949), The King and I (1951), and The Sound of Music (1959). Filmed versions of these shows, which reached much wider worldwide audiences, were released over an even shorter time span – Oklahoma! (1955), Carousel (1956), The King and I (1956), South Pacific (1958), and The Sound of Music (1965) – and they collectively had the effect of establishing a new, indelible genre. Expectations were established back then that there would always be a new and wonderful musical film coming just around the corner. But Rodgers and Hammerstein were unique, and their “golden age” of musicals has never since been matched. 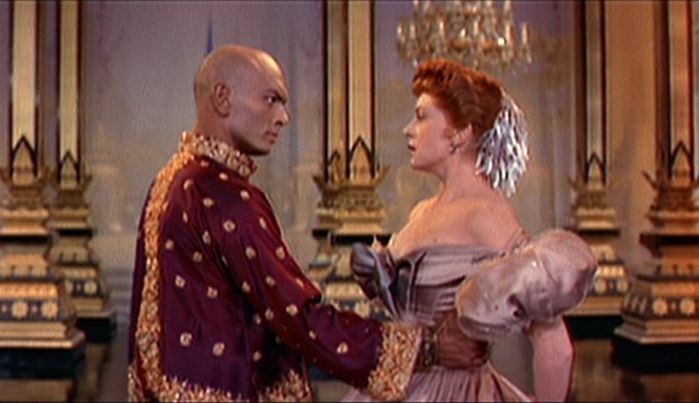 Of that string of hit musical films, The King and I (1956), with its exotic setting and eccentric leading character, was a particularly memorable Rodgers & Hammerstein creation and remains a favorite to this day . 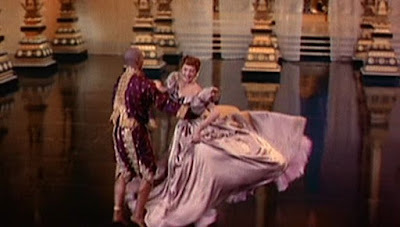 Directed by Walter Lang and choreographed by Jerome Robbins, the film was nominated for 9 Oscars and won 5 of them, mostly associated with its lavish production values. Perhaps the most significant contributor to that production, though, was the actor Yul Brynner, who played the role of the King of Siam. With his shaved head (in those days a rarity) and emphatic gestures, Brynner stamped the entire production with his own unique stage personality. Brynner had been the star of the original Broadway production, too, and throughout his career he replayed the role in revived versions of the musical play, so that by the end of his life, he had played the role on stage more than 4,600 times. However, all along the way, including even with Leonowens’s’ original memoirs, there were considerable liberties taken with respect to historical accuracy. So by the time we get to the film, some significant deviations from the historically true account had crept into the story. Indeed this may partly account for why both the stage musical and the film were banned from being shown in Thailand, where draconian lèse majesté laws prohibit any depictions of the royal family that might be construed as disrespectful . Anyway, those issues of historical accuracy are not my concern here; the film’s narrative is a fascinating and entertaining tale, irrespective of its historical precision. We should remember, as I mentioned in my review of Oklahoma!, that musical films are by their very nature expressionistic. The songs and dances shown in such films reflect the emotive states of the characters, and so the expressionism here is not so much present in the physical environmental context (the usual case with expressionistic films), but rather in a musical context. And since the films are expressionistic, we cannot really expect them to present an “objective” account of the events depicted. But they still may offer and reflect some inner truth worth holding onto. Human Rights. Along with modern scientific thinking came notions of basic human rights. Siam was still saturated with slavery, and obeisance to the king was always mandatory. These backward restrictions are still reflected today in the country’s lèse majesté prohibitions. Equality of Women. The idea that women could be equal to men was shocking to the Siam of 1862. This is a recurring theme in the film. Love. Associated with Modernism is a reductive, “Objectivist” way of looking at the world that increasingly impoverishes and threatens our existence. Love opens the door to another way of being, and this, too, is alluded to in the film. The story of The King and I is set in the traditional theatrical arrangement of two acts separated by an intermission. Like Oklahoma!, the first act has most of the songs in it and sets the overall mood, while the second act is shorter and contains a dramatic turn of events that leads to a crisis. The film’s focalization focus, the widowed Englishwoman Anna Leonowens (played by Deborah Kerr), arrives in Bangkok and is introduced to King Mongkut (Yul Brynner). She is to be the teacher of fifteen children of the King’s many wives – there are sixty-seven other children of the King’s less favored wives who are not included. Right away there is conflict between Anna and Mongkut over whether the imperious king will live up to his promise to give Anna and her young son their own house. Also introduced is Tuptim (Rita Moreno), a young woman who has been presented to Mongkut as a gift from the Prince of Burma. It is immediately evident that Tuptim is in love with the man who has been ordered to deliver this gift, Lun Tha (Carlos Rivas). After one of their arguments, Anna finally decides to return to England. However, the King’s senior wife, Lady Thiang (Terry Saunders), comes to Anna’s room and beseeches her in a beautiful song, “Something Wonderful”, to stay. Anna relents and learns that the King is worried that British imperialists see him only as a “barbarian” in need of protective takeover. Anna convinces the King to invite the British diplomats to a “Westernized” banquet to show how civilized he is. Act 1 features a string of great songs – “I Whistle a Happy Tune” (Anna), “The March of the Siamese Children” (orchestral), “Hello, Young Lovers” (Anna), “A Puzzlement” (King Mongkut), “Getting to Know You” (Anna), “We Kiss in a Shadow” (Tuptim and Lun Tha), and “Something Wonderful” (Lady Thiang). For the songs sung by Anna, Deborah Kerr’s voice was dubbed by Marni Nixon, who also sang the songs for Maria in West Side Story (1961). The voices of Rita Moreno (Tuptim) and Carlos Rivas (Lun Tha) were also dubbed, by Leona Gordon and Reuben Fuentes, respectively. 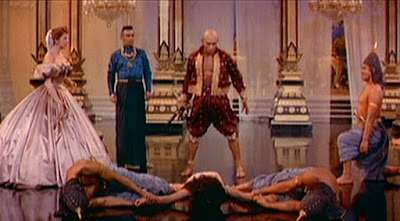 However, Yul Brynner (King Mongtuk) and Terry Saunders (Lady Thiang) performed their own vocals. In Act 2 the banquet is held, and with Anna’s coaching, King Mongkut impresses his foreign guests as an enlightened monarch. The after dinner entertainment for the hosted guests is a balletic play composed by Tuptim that is based on Harriet Beecher Stowe’s famous anti-slavery novel Uncle Tom’s Cabin (1852). This 14-minute dance scene, unlike similar lengthy Act 2 dance scenes in Oklahoma! and Carousel, is brilliant. Those dance numbers in Oklahoma! and Carousel are tedious interruptions that don’t integrate well with the rest of their films, whereas this piece in The King and I significantly contributes to the narrative. Credit is due to Jerome Robbins’s choreography and the colorful staging of this entrancing piece. Tuptim’s anti-slavery theatrical diatribe doesn’t go down well with King Mongtuk, since she is his slave and is demanding her freedom. But the King is elated over his banquet success and doesn’t notice that Tuptim disappears after the balletic play comes to an end. In fact the King is so satisfied at this point that he speaks to Anna alone afterwards and gives her a precious ring that he takes off his own hand. Then they talk about how men and women socialize in the West. He exuberantly sings a little rhetorical song to her about honeybees and blossoms that reflect his view of the naturally marked inequality between men and women – an attitude that is in striking contrast with Anna’s Western egalitarian views. Then when Anna reminisces about what it was like to go to a dance by singing the song “Shall We Dance?”, the King enthusiastically takes Anna in his arms and waltzes around the room with her. Their waltzing is interrupted by an announcement that Tuptim has been captured trying to flee the royal palace. The King’s authoritarian instincts tell him to whip the poor girl, but when he looks at Anna’s horrified face, he feels a conflicting passion and cannot go through with it. He immediately becomes despondent and isolates himself from everybody. The closing scenes are sad, as the King’s despondency evidently leads to his deteriorating health and immanent death . Before he dies, Anna promises to him that she will stay in Bangkok and provide guidance for the King’s crown prince son and future king. 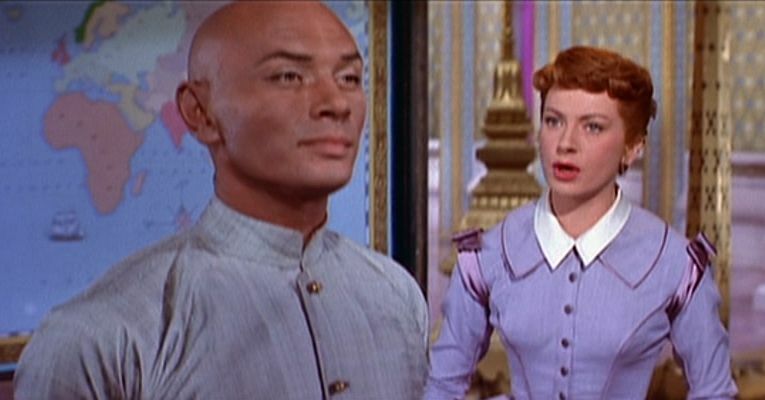 The great popularity of The King and I is of course largely attributable to the music of Rodgers and Hammerstein. 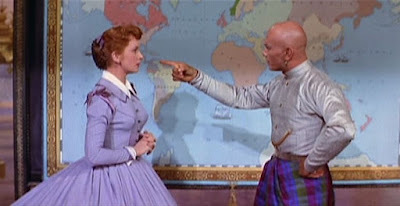 But just as important was the onscreen chemistry between Deborah Kerr and Yul Brynner. 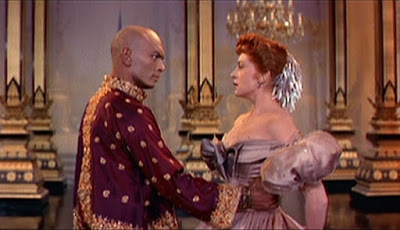 Kerr perfectly embodies the essence of Western feminine civility (seen through a 19th century British lens); while Brynner energizes the male side of the relationship with his infectious and rambunctious personality. 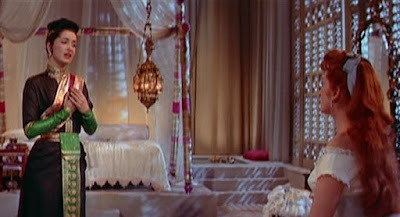 Most of the memorable dramatic scenes in the film, apart from the songs, involve their various encounters and efforts to bridge the enormous gap between them. However, beyond the evolving and tentatively romantic relationship of those two, there are those three overlying (and, I will argue, overlapping) social issues that I mentioned earlier – Human Rights, Women’s Inequality, and Love. These are not much explicitly articulated in the film, but they are worth our further consideration. The first two of those social issues – Human Rights and Women’s Inequality – are clear cut. Slavery was rife in Siam, and Tuptim’s designated punishment for trying to escape was torture by whipping. Mongtuk’s many wives were essentially concubines and were brought up to believe they were inferior beings. In fact when they first see Anna’s independent bearing and assertiveness, they address her as “Sir”, since she seemed to have the self-possession that only a man could have. So the implication seems to be that if King Mongtuk was truly wishing to modernize Siam, he should also introduce Western norms and laws in line with human rights and the inequality of women. This he was reluctant to do, but by the end of the film he (and perhaps his crown prince son, too) seems to have begun to acquiesce on some of these matters. I have argued elsewhere that for a modern country to be successful in the globalized world, it need to have a structure that provides Human Rights, Open Markets, Democracy, and the Rule of Law (RMDL) . In other words, what King Mongtuk needed to do was to align his country with the principles of RMDL, which are derived from liberal ideas that arose from the Enlightenment (Age of Reason) and continued over the last several hundred years in Europe and North America. Of course, the details concerning how to establish an efficient, fair, and just society are more complicated, but the advantages of the simple RMDL formulation is that it can be remembered and easily propagated to the populace by those who wish to make it the basis of their democratic government aspirations. This is important, because even today there are many countries across the globe that claim to embrace “scientific thinking” but fall far short of truly implementing the RMDL principles. However, the RMDL principles are still based on Western modernist ideas, and there are some cogent currents of thought that claim that Western modernist principles omit some important aspects of being and thereby limit us. Martin Heidegger, for example, in his essay The Question Concerning Technology (1955/1977)  argued that modern technology, by relying on objective analysis and seeing everything in nature as “standing reserve”, limits our focus to a reductionist perspective of reality . It’s not just that modern technology exploits and often misuses the natural world and the common pool resources within it. The problem is, beyond those acknowledged problems, modern technology severely restricts the way we see the world, including how we see ourselves. Thus this reductionist perspective, which can be called “Objectivism”, not only restricts our view, but also restricts our very being. Heidegger, Maurice Merleau-Ponty, and others have argued that we need an “Interactionist” perspective that embodies the full compass of experience . Note that it is not that the Objectivist perspective is wrong and should be discarded. Objectivist models have proven to be enormously useful approximations of reality. But besides their utility, reductive Objectivist notions limit our perspective – they don’t encompass the full, rich nature of reality. We instinctively feel this when we contemplate the difference between “knowing what” (e.g. an Objectivist model of physics) and “knowing how” (e.g. the Interactionist skills of walking and being able to ride a bicycle) . Such Interactionist engagements with the world involve what Merleau-Ponty called the “intentional arc” – our tight, fully-connected interactions involving our wholly embodied selves. What the Interactionists are saying is that the world of our being is much richer than our Objectivist models allow. As an example of the impoverishment of total Objectivist thinking, some reductivist philosophers, mindful of Objectivism’s failure to account for consciousness, have argued that consciousness doesn’t really exist and is merely an illusion. This is what happens when your Objectivist blinders restrict your full experience of being. They suggest that (a) it is the Buddhi, with its Objectivist perspective, that has come to dominate our daily lives and that (b) we are not living our lives in awareness of and accord with the full spectrum of mindful being. When near the end of the film King Mongtuk, full of angry resentment, is about to whip poor Tuptim for trying to escape, he glances at Anna’s horrified face. His vengeful Buddhi mind has been telling him that he must administer the punishment – these are the rules. But now another feeling, from another quarter of his consciousness, has intervened. This is his feeling of hitherto unacknowledged love for Anna. At the end of the film, Anna confesses to her young son that she, too, felt a love for the King. This is what we all need in order to help our increasingly interconnected and threatened world survive – a full implementation of RMDL principles and a readiness to respond to the call of love. This was perhaps best expressed in my favorite song of the film, Lady Thiang’s heartfelt invocation of “Something Wonderful”. Bosley Crowther, “Screen: 'The Kind and I'”, The New York Times, (29 June 1956). “The King and I”, Wikipedia, (24 March 2017). “Lèse majesté in Thailand”, Wikipedia, (25 March 2017). This is a historical fabrication, although the real King Mongkut did die of malaria in 1868. See my reviews of Head Wind (2008), Manuscripts Don’t Burn (2013), An Enemy of the People (Ganashatru, 1989), Ai Weiwei: Never Sorry (2012), Michael Moore in Trumpland (2016), and Taxi (2015). Martin Heidegger, The Question Concerning Technology and Other Essays, William Levitt (trans. ), Harper, (1977), pp. 3-35. Mark Blitz, “Understanding Heidegger on Technology“, The New Atlantis, (Number 41, Winter 2014). The Film Sufi, “Existentialism in Film 1", The Film Sufi, (15 July 2008). The Film Sufi, “"Lessons of Darkness" - Werner Herzog (1992)”, The Film Sufi, (30 May 2010). The Film Sufi, ““Memento” - Christopher Nolan (2000)”, The Film Sufi, (4 January 2013). The Film Sufi, ““SiCKO” - Michael Moore (2007)”, The Film Sufi, (2 October 2013). The Film Sufi, ““Avatar” - James Cameron (2009)”, The Film Sufi, (16 May 2010). Martin K. Purvis & Maryam A. Purvis, “Institutional expertise in the Service-Dominant Logic: Knowing how and knowing what”, Journal of Marketing Management 28:13-14, 1626-1641, (23 November 2012). Sadhguru, “Harnessing the True Power of the Mind”, (Yoga & Meditation, Science of Yoga), Isha, (15 May 2015). There are also Buddhist notions and other variants that offer different partitionings, but they have the similar idea that our very being can be reduced by not being aware of the full abundance of mindful interactive existence.